One day Mullah Nasruddin entered his favorite teahouse and said: 'The moon is more useful than the sun'. An old man asked 'Why mulla?' Nasruddin replied 'We need the light more during the night than during the day. A friend asked the mulla "How old are you?" "Forty replied the mullah." The friend said but you said the same thing two years ago!" "Yes" replied the mullah, "I always stand by what I have said." Once, when Mullah Nasruddin was visiting a Western town, he was invited to attend a fashion show. He went, and afterwards he was asked how he liked it. "It's a complete swindle!" he exclaimed indignantly. "Whatever do you mean?" he was asked. "They show you the women - and then try to sell you the clothes!" 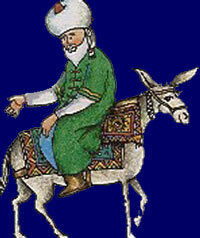 One day , one of Mullah Nasruddin's friend came over and wanted to borrow his donkey for a day or two. Mullah, knowing his friend, was not kindly inclined to the request, and came up with the excuse that someone had already borrowed his donkey. Just as Mullah uttered these words, his donkey started braying in his backyard. Hearing the sound, his friend gave him an accusing look, to which Mullah replied: "I refuse to have any further dealings with you since you take a donkey's word over mine." The boy then let his father ride while he walked. Hodja rode and the boy walked by his side. Soon they met another group. In exasperation, Hodja lifted the donkey onto his shoulders and said, �Come on, if we don't do this, it will be impossible to make people stop talking. Once when Nasreddin Hodja was serving as Qadi, one of his neighbors came to him with a complaint against a fellow neighbor. The Hodja listened to the charges carefully, then concluded, "Yes, dear neighbor, you are quite right." Then the other neighbor came to him. The Hodja listened to his defense carefully, then concluded, "Yes, dear neighbor, you are quite right." The Hodja's wife, having listened in on the entire proceeding, said to him, "Husband, both men cannot be right." The Hodja answered, "Yes, dear wife, you are quite right."